Pioneer takes Steez Audio brand to the streets | What Hi-Fi? Pioneer has announced a new Steez Audio brand of portable music systems, MP3 players and headphones. Looking to capitalise on the increasing popularity of street dance, the products come with some unique functions for mixing your tunes when used in tandem with Pioneer's new, free to download Mixtrax application. The Steez Audio is a rugged-looking, rainproof speaker system, available in two different models, the STZ-D10T aka 'Tough' (pictured in green), and the STZ-D10Z aka 'Big' (pictured in red). Taking a design cue from an old skool ghetto blaster, both have an internal 4GB memory for music as well as USB and 3.5mm inputs and built-in iPod docks. But the real USP of the Steez Audio speaker comes from using it with the Mixtrax PC software. Mixtrax analyses track information such as the beat and tempo when you load your music. Once this is done it transfers your tunes to your Steez Audio or Steez Portable's internal memory, and in so doing opens up some nice features. The Steez Audio speaker system can match tracks by genre, called Auto Battle Mode, and play similar tracks in a continuous mix, DJ Mix Mode. You can also adjust the tempo of tracks without changing the key and cue tracks from preset positions. Similarly the Steez Portable can automatically blend tracks in to a continuous mix, while also allowing you to adjust the speed of tracks and find tracks with a similar tempo. The Steez Portable has a 4GB capacity, an OLED screen and can play MP3, AAC, WMV and WAV files. Last but not least in the range are the Steez Headphones. Built with dance music in mind – Pioneer has plenty of heritage in the DJ and dance music world – they have a 40mm speaker, a choice of coloured ear pads and can be folded for portability. 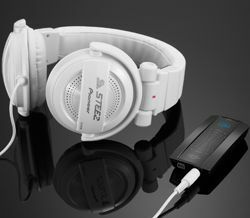 The Steez products will be available from October, with the headphones to follow in November.